Nokia seems intent on selling a Lumia Windows Phone at every possible price point and its latest mid-range device is the Lumia 720. We love the stylish design, the good battery life and the low light camera performance. However, the Lumia 720 isn't competitively priced and its minimal amount of RAM means some Windows Phone games are incompatible. If you're annoyed by the trend of huge smartphones, you're going to love holding the Lumia 720. Nokia may have slipped well behind the likes of Apple and Samsung in the smartphone market but there's no doubt that the Finnish giant knows how to manufacture an attractive smartphone. The Lumia 720 is the perfect size. Its screen is large enough to display the attractive Windows Phone 8 interface but the phone is small enough to comfortably use with one hand. If you're annoyed by the trend of huge smartphones, you're going to love holding the Lumia 720. The Lumia 720 has a polycarbonate shell with rounded, curved edges and an almost completely flat front. At 9mm thick and weighing 128g, it's one of Nokia's thinnest and lightest Windows Phone devices. Adding to its light weight and thin form factor is excellent build quality. The Lumia 720 feels impeccably well constructed and there's no evident creaks or rattles, even when significant force is applied to the polycarbonate body. 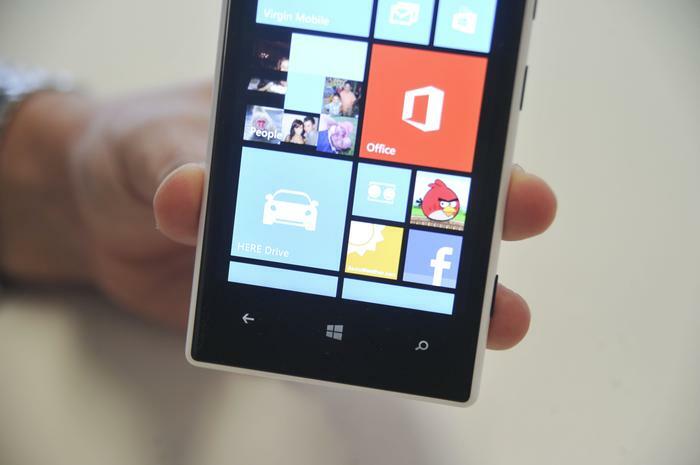 The Nokia Lumia 720 is small enough to comfortably use with one hand. The"glossy white" Lumia 720 is very slippery to hold and shows up plenty of fingerprints. Our review unit of the Lumia 720 was a "glossy white" colour variant which was very slippery to hold and showed up plenty of fingerprints. 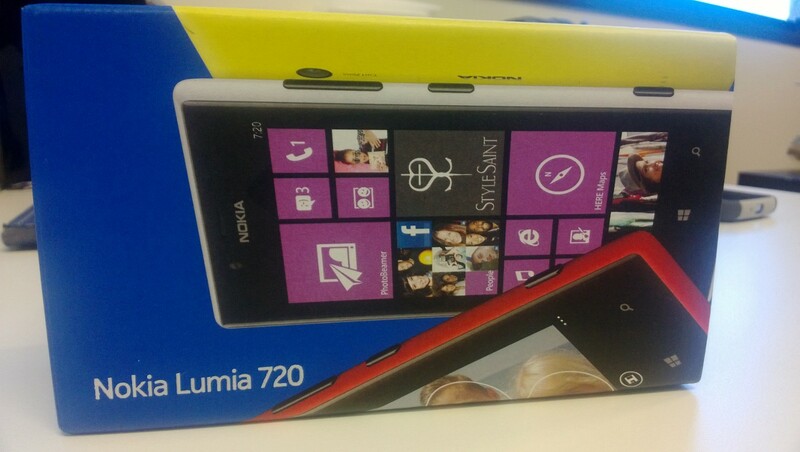 The Lumia 720 is also available in glossy yellow, glossy red, matte cyan and matte black colour variants. We would highly recommend opting for one of the matte colours for a far more comfortable experience. The Lumia 720's battery isn't removable but the phone does have a microSD card slot on the left side for extra storage, so the 8GB of internal memory can be expanded. You'll need to use the included eject tool to remove the tray that holds both the microSD card and the SIM-card tray at the top of the phone. The "glossy white" model of the Lumia 720 is slippery and shows up plenty of fingerprints. Nokia has laid out the Lumia 720's controls in typically Windows Phone fashion. There's a standard headphone jack on the top, volume, power/lock and a dedicated camera button on the right and a standard micro-USB port for charging on the bottom. The buttons on the right side are very well positioned for comfortable single-handed use. Windows Phone's standard, touch-sensitive back, home and search buttons sit just below the screen and they're very responsive. The Lumia 720's screen boasts accurate colours and good viewing angles. The Nokia Lumia 720 has a 4.3in IPS touchscreen with a resolution of 800x480. This resolution obviously can't match more expensive phones and therefore the Lumia 720 can't display the same crisp text as many devices on the market. However, it displays excellent and accurate colours, has good viewing angles and is bright and clear. Nokia says the Lumia 720 is the first phone to feature curved glass at this price point and it gives the effect that the images are floating on the screen. There's visible pixels if you look close enough but the ClearBlack display does a relatively good job of displaying the vibrant Windows Phone OS and sunlight legibility is better than many smartphones on the market. One notable feature is that the screen responds to touches even if you're wearing gloves. It's a handy function for those in cool climates, but it's not as relevant in Australia. The Nokia Lumia 720 has a 4.3in IPS touchscreen with a resolution of 800x480. The Nokia Lumia 720 runs the latest version of Microsoft's Windows Phone platform, Windows Phone 8. One of the best feature of Windows Phones is the fact that the user experience is virtually identical on all models, despite the price range. The Lumia 720 gets almost all of the same software features in more expensive models like the Lumia 920 and the Lumia 820. Nokia's range of apps and features are significantly impressive. For a phone at this price point, Nokia's range of apps and features are significantly impressive. The Here Maps application is more comprehensive than Apple Maps and even betters Google Maps on Android phones in some ways. It allows you to download a range of maps from entire countries to use when you don't have any mobile network coverage. In addition, Here Drive Beta provides free turn-by-turn navigation in a clean and easy to navigate layout. The ability to download maps means the navigation service doesn't use any mobile data, just the Lumia 720's built-in GPS chip. 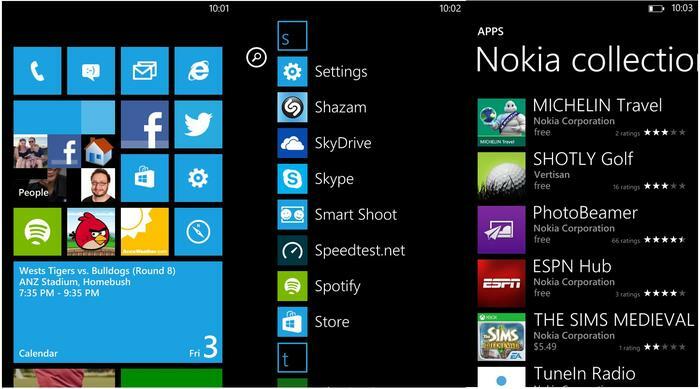 The Windows Phone interface on the Nokia Lumia 720. The Windows Phone 8 OS itself also has some excellent core features and they're all available on the Lumia 720. All users receive 7GB of SkyDrive Storage for free. The built-in, free Microsoft Office app handles Word and Excel documents with ease and is without a doubt the best office client on any mobile platform. The Xbox Music service is also decent value at $11.99 per month or $119.90 per year for unlimited music streaming. Many iOS and Android apps simply aren't available on Windows Phone. The biggest downside to the Nokia Lumia 720 is a lack of popular third-party apps. A visit to the Microsoft App Store will quickly tell you all you need to know but many apps we use on a daily basis on iOS and Android simply aren't available on Windows Phone. Although the store continues to expand and improve over time, the price of paid apps on the Windows Phone platform seem higher than competing platforms. This is a particular concern for mid-range handsets like the Lumia 720. The Nokia Lumia 720 offers excellent performance. The 1GHz dual-core processor and 512MB of RAM might not sound like much on paper but they make for a smooth and fast user experience. Scrolling is smoother than almost any Android phone, there is no lag when switching between apps and performance is consistent and snappy. Overall, the combination of the Windows Phone 8 OS and the Lumia 720's hardware, even if it's far from the cutting edge, makes for a speedy and efficient device. 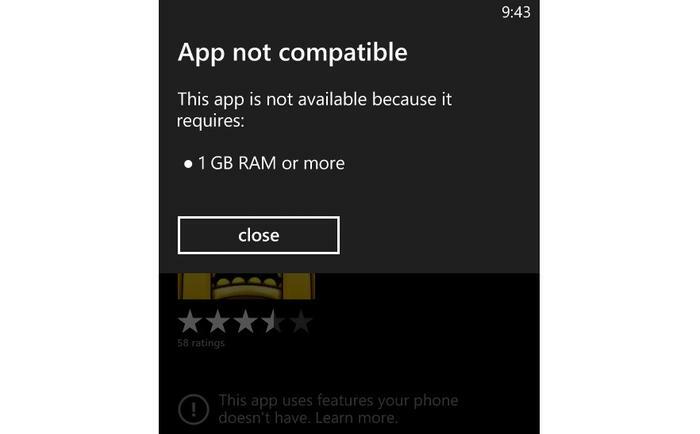 Some games on Windows Phone require 1GB of RAM. There is one significant issue with the Lumia 720's 512MB of RAM, however. There are some games in the Windows Store that require a minimum of 1GB to work. The likes of Temple Run and Real Football are two examples of games that therefore aren't compatible with the Lumia 720. If you're not into playing games on your smartphone then it won't concern you but for those who do, we can't recommend the Lumia 720. The Lumia 720 produces impressive photos in low light. The Lumia 720 has a 6.7-megapixel camera with a Carl Zeiss lens and an f/1.9 aperture. The company claims the latter is bigger than almost any high-end smartphone on the market and will therefore capture better photos in low-light conditions. It can't record full HD video, though, topping out at a maximum of 720p. Video quality is excellent for a phone in this price range. The Lumia 720 produces impressive photos in low light, even if you don't use the single-LED flash. Photos outdoors in good light are a little less impressive. In these kinds of environments, we found that the Lumia 720's camera produced images with dull colour. A photo we captured with the Nokia Lumia 720 (click to enlarge). The Lumia 720 also includes a 1.3-megapixel camera with a wide-angle lens, which means you can capture more area than most other front-facing smartphone cameras. We found it worked well for front-facing video calls through Skype, especially if you're using the phone to keep in contact with family. However, the quality of both still images and video through the front-camera are disappointing. The Lumia 720 comes preloaded with a number of Nokia's existing digital camera lens apps, including the Cinemagraph, Smart Shoot, and Panorama lens, while the 'Glam Me' lense can be installed for free from the Windows Marketplace. The latter is a filter that allows users to spruce up "selfies" captured with the front camera. These are all valuable additions, but they open in a seperate app to the camera despite being present in the options menu, which is annoying. The Nokia Lumia 720 has excellent battery life. The Nokia Lumia 720 doesn't include native wireless charging but Nokia sells an optional snap-on cover that includes wireless charging capabilities. With this accessory attached, the phone becomes compatible with a range of first party charging accessories including a wireless charging plate, a charging pillow, a charging stand and a wireless charging speaker developed in conjunction with JBL. The phone also has built-in NFC connectivity. The Nokia Lumia 720 has excellent battery life. It easily lasted a full day during our testing, and if you forget to charge it overnight you should find that it will last a few hours into a second day, too. The 2000mAh battery is rather large considering the lack of 4G and the smaller 4.3in screen size, but it's definitely a huge plus for this device. The Nokia Lumia 720 is available now through Virgin Mobile for $0 on the Big Plan $29. Harvey Norman is also selling the device for $347 outright.